Isn’t there more to first-class travel than pre-boarding, a plastic flute of champagne and fighting a guy with cargo shorts and too many opinions about the greens at Augusta for an armrest? Take heart, traveler. The answer is yes. For three magical years, things truly were better. 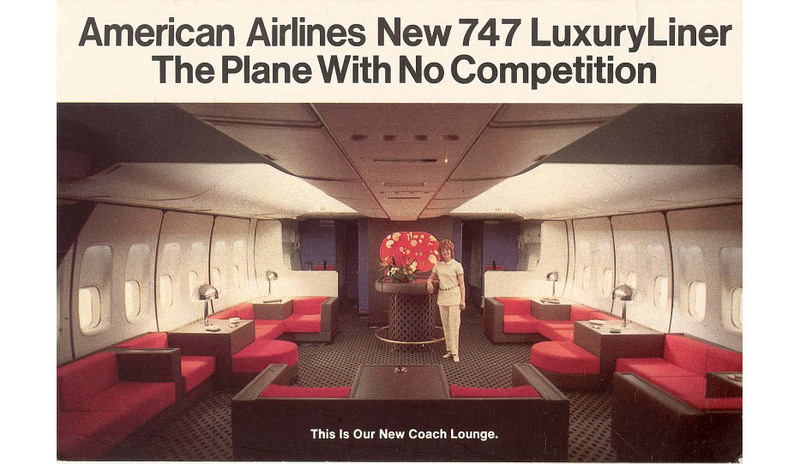 But the story’s less about the distinction between first class and coach than it is about the introduction of coach in the first place, and what that presaged for commercial luxury. In the beginning, there was a large fixed-wing vehicle. With seats. That could fly. And not much else. In the earliest days of commercial air travel (est. 1914), it was all first class. Hopping on an airship was cost prohibitive for most, and payloads were limited enough by technology that space for amenities was ample. That said, the rides were loud, choppy and pretty much insufferable. 1928: Enter the two-tiered system for flights between Paris and London. First class gets better planes and departure times. “Second” class leaves early in the morning on its own second-class planes and passengers are encouraged to pack a lunch. The difference in fares: $5.50 (or about $77 with inflation adjustments). 1933-37: Rigid airships make a bid for the luxury traveler with no love for crowds or rabble. There are complications. 1939: Pan American gets into the flying boat business with its Clipper class of Boeing 314s. All first class all the way, with five-course meals, gendered changing rooms and convertible sleeping berths. Transatlantic flights remained interminable and WWII put the freeze on them in short time. 1952: Say hello to Howard Hughes’s baby, The Constellation. Say hello to “tourist” class travel. All of the major players offer economy flights in addition to their standard luxury routes, with the exception of one plane-starved Belgian outfit offering then-unheard-of two-tiered seating on the same aircraft. 1958: The Jet Age begins. With it: faster, more comfortable flights and the beginning of the end for first class. The rub: the jet engine can handle a greater load, and with great capacity comes great obligation to shareholders to maximize butts in seats. This same year, hamstrung by IATA regulations on fares, the industry looks into its heart to suss out how best to manage the class divide. United does away with the system entirely, opting for single-fare seats in the middle of the price divide with compromises in service. Others double down on tiers. 1964: United gets lonely and adopts a three-class service. 1970: Pan Am goes all in on the 747 and others follow suit, eyeballing range as its most economical feature and making the most of its interior to church up the luxury of flight. Even coach was fancy by contemporary standards. Seriously. That’s what a bar in the cheap seats looked like. Because naturally you were encouraged to visit the bar. Even. In. Coach. This is it. This is the Golden Age. 1973-83: The oil crisis sends operating costs through the roof, and ultimately the planes are relegated to cargo routes or optimized for maximum seating occupancy. Point being, because it costs about the same to run a 747 with sardine-can efficiency as it does to comfortably transport half that number of souls, decisions were made. Landing us here. In the present. Paying premiums for ever-shrinking legroom, an eye mask and a power outlet. The included drinks are only here to pacify you, my man. Hey, at least they ditched the two-drink max of the ‘60s, right? Yet there’s a glimmer of hope, assuming you can truly afford the relative expense of yesteryear’s first-class travel and have business in or around Dubai.